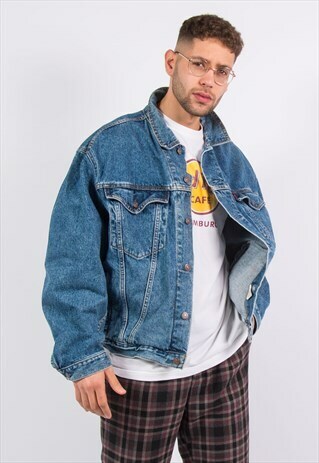 Levi's vintage denim jacket. Label says L fits UK XL. Model is a UK size L and is 6'2". ORDER BEFORE 2.45PM FOR SAME DAY DISPATCH. Next day delivery is available Monday - Friday only. Please get in touch for Saturday delivery. All orders placed after 2.45pm Friday will not be processed until the following Monday. All measurements are provided under the sizing and care tab, to ensure the desired fit please check these against yourself or a similar item of clothing that you may own. All of our items are vintage, we only ever have one of each item available. Returns accepted within 14 days of purchase. If you have any questions about this item or anything else please just drop us a message we will be happy to help. Follow us on Instagram to see all of our latest updates thevintagescene. Pit to Pit: 28" Pit to Cuff: 19" Nape to Hem: 25.5"